You don't need to uninstall the BarTender Suite to install Seagull License Server (SLS) on a computer. You can simply modify your installation to add SLS. For more information regarding Seagull License Server and how it works, refer to What is Seagull License Server? Proceed to the Uninstall a Program or Add/Remove a Program panel. You will see a list of all the programs installed on your computer. Right-click on BarTender. 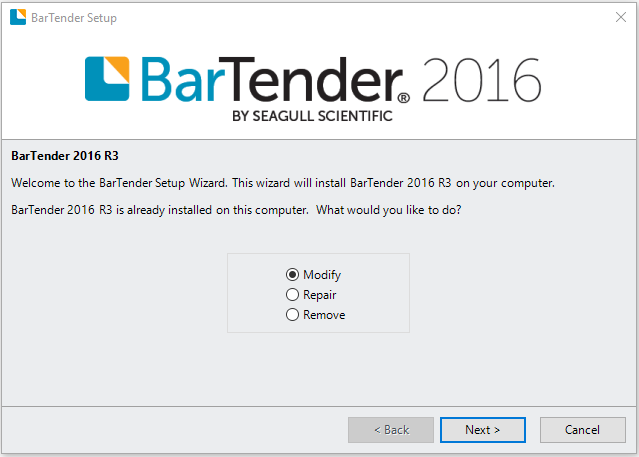 From the context menu, select Change to open the BarTender Setup wizard. Select Modify and click Next to open the Advanced Installation Options window. Under Applications and Modules, select (check) the License Server check box. Do not check or uncheck any other boxes. Click Next to open the Installation Complete screen. 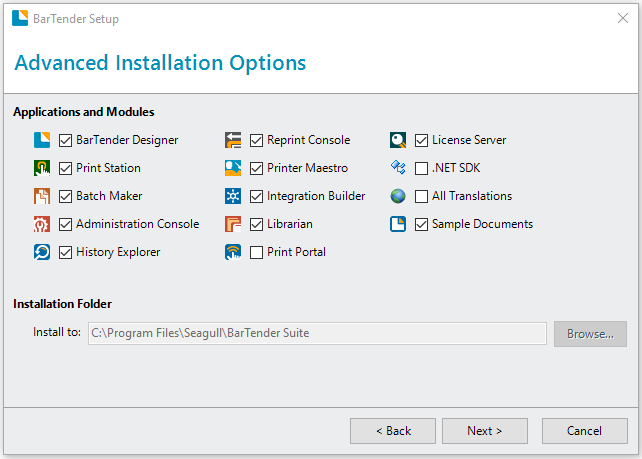 Click Finish to complete your installation of Seagull License Server. For Windows 10, from the Windows menu, select All Apps > BarTender 2016 > Seagull License Server. In earlier editions of Windows, from the Start menu, select All programs > BarTender folder > Seagull License Server. You will be prompted to start SLS. Click Start Seagull License Server Now. The Activation Wizard opens. Enter your Product Key Code and click through the Wizard to finish activating SLS. Note: The Activation Wizard activates over the internet. If you need to activate the SLS on a computer without an internet connection, please contact Technical Support. Once you have activated the Seagull License Server, you can close it. It runs as a service and will continue to run in the background even when the application is closed.